A stroll through activities during Chestertown, Maryland’s annual Tea Party Festival is a fine way to celebrate Memorial Day weekend. Every year the festival seems to grow larger and be more fun with so many people gathering to celebrate the meaning of the holiday. Now in its 39th consecutive year, the Tea Party Festival offers a look back at our colonial past. There will also be local musical entertainment, children’s activities, crafts, wine and beer tastings, and more. The highlight of the weekend is the reenactment of Colonists and Tories as they march to the Chester River. 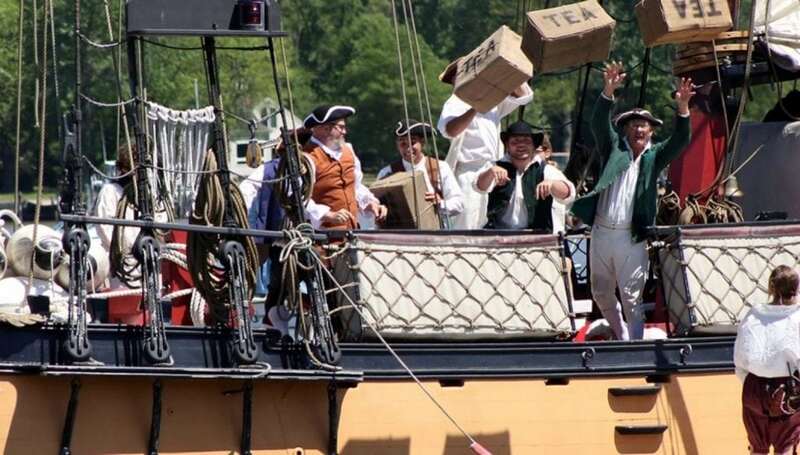 There, they board Chestertown’s 18th-century tall ship, Sultana, to dispatch its cargo of tea overboard. Plenty of anchoring space is available on the Chester River allowing dinghies and paddlers easy access to Wilmer Park right in the heart of the festival. Festivities start with a street party on Friday evening in front of the Garfield Center for the Arts that includes barbecue, music and children’s activities. Saturday begins with a colonial parade at 10 AM that includes the U.S. Army Old Guard Fife and Drum Corps, and at 2 PM, the tea reenactment begins. Beer and wine tasting starts at noon on Sunday with the much-anticipated raft race on the Chester at 2:30 PM.